Since most smartphones have a very capable camera, people are taking lots of pictures these days. But the tools for organizing, editing, and sharing them beyond social media are pretty limited, especially if you want to use the images for instruction. And don’t want to pay a lot for them. 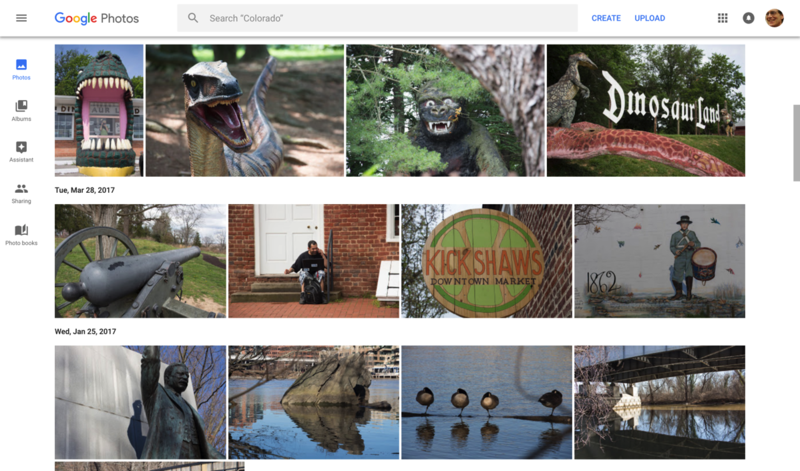 This post is a quick introduction to a pretty good resource that you probably already have: Google Photos. Google Photos is part of your regular Google account, although that’s not especially obvious. So continue to see how it works and what you can do with it. Start by going to photos.google.com and sign in with your regular account credentials. If you have more than one Google account, remember that the pictures you store in one will not automatically appear in the other. However, as with other documents, you can share images and folders. 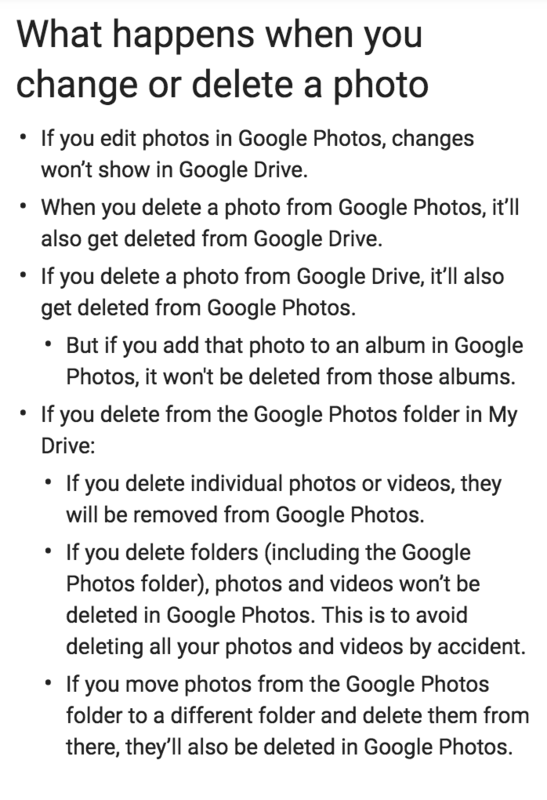 Another important distinction is that Google Photos is not the same as the Photos folder you may see in your Drive account. They can be connected to some degree, as I explain later. When you open Google Photos for the first time, you will, of course, see nothing, unlike the shot above from my account. But the basic interface is pretty simple. Click the Upload button at the top to get started. Or simply drag some images from your computer into the browser window. This works best, as you might expect, in the Chrome browser. The icons at the left allow you to create new albums (very much the same as folders in Drive), organize simple photo books for printing, and choices for sharing. I’ll explain a little about Assistant and those features next. The Create link at the top of the page gives you the same options. Notice that the images in Photos are organized by the date the image was taken. Currently there is no other way to list them. Click on any image to open it. Click the left and right arrow to step through your pictures in order. Click the arrow at the top left to return to the collection. After opening a photo you can bring the picture into the editor (which I’ll cover in another post), get information about it such as when it was taken and where, if the GPS data is available. You can also share the image, download, or delete it. An album in Google Photos acts like a folder and it allows you to share a group of photos. More details about Albums and Shared albums are in this post. Photo Book allows you to lay out a printed book with 20 to 100 pages, one picture per page, plus one on the front and back covers. The cost of a book starts at around $10 for a soft cover book and $20 for hard cover. More pages means a higher price. Movie offers a few templates around specific themes, none of which are especially instructional, around which to build a movie-like slide show. However, this feature depends on Google’s face recognition, which groups your pictures based on the common faces it finds in them. Photos also offers the option to make a more elaborate movie using apps you can install. For a collage you choose up to 9 images from any of the photos in your collection to create a single page. Animation is basically a GIF slide show that can use up to 50 images. As I said earlier, Google Photos is not the same as the Photos folder you may have in your Drive account. The Google Photos is a tool for storing and managing your photos while Photos in Drive is simply a folder with one specific storage purpose. However, the two can be connected. In your Drive settings, look near the bottom for the option to Create a Google Photo folder. 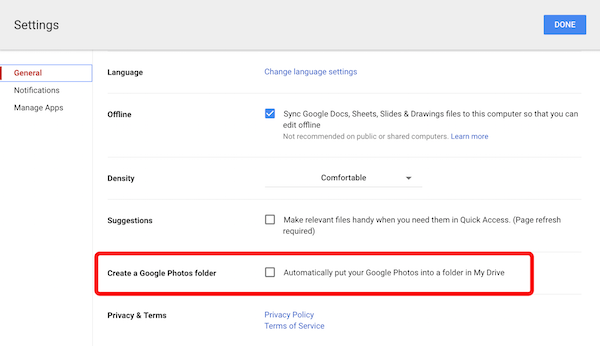 Checking the box will place a folder called Photos in the left column (if one doesn’t already exist) and copy the images in your Google Photos account into the folder. However, the connection between Photos and the Photo folder is not completely dynamic. The relationship is a little confusing, so I’ll let Google explain the details. The best way to understand all of this is to play with it. Just don’t get rid of your original photos until you’re comfortable with Google’s management system. Any images that are 15mb or smaller and uploaded from your computer to Google Photos do not count against your storage limits. Larger files and “original” quality files do count. Original quality files are photos you have told Google not to compress and that is an option you will find in the settings for Google Photos. None of this applies to photos taken with and uploaded from your mobile device. I’m also not sure whether the same limits apply to GSuite for Education accounts so you may want to check with your system administrator. Two cautions to all this: Google providing free, unlimited storage of your photos applies at the date of this post. As with everything Google, it is subject to change. In addition, remember that Google is analyzing everything you upload. With photos, they say that they’re working to improve things like face recognition, but your images could be used to improve targeted advertising. Just be careful out there. Coming back to your smartphone or tablet, you’ll need an easy way to get your photos from the device to Google Photos and there is an app for that. Search the Apple App store or Google Play store and download the Google Photos app. But don’t start using it until you make one big change. By default the Google Photos app is set to automatically upload all your photos to the cloud. That would be everything currently on your phone and every new picture you take. If you are working with a personal Google account, that’s probably a good plan. If not, open the app settings (the gear icon you’ll find in the upper right corner under the hamburger menu). The first option is Back up & sync. Tap that and turn it off. Now to use the Photos app you’ll need to manually select the images you want to upload. To do that, tap the three dot menu at the top right corner and choose Select photos. Then tap each of the images you want to include (you’ll get a check mark with a blue background on each). Finally, tap the three dot menu again and choose Back up.